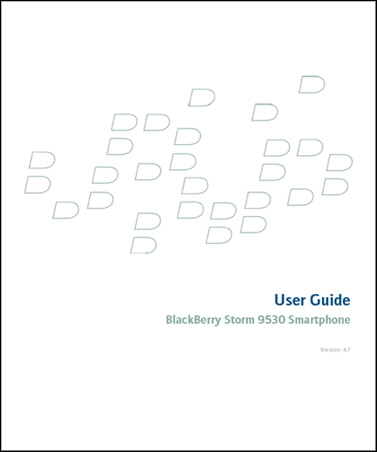 BlackBerry Storm 9530 User Manual Emerges! Click the image above and you can download the 249 page user manual (1.18MB .pdf file) for the soon-to-be released BlackBerry Storm 9530. If you have any lingering questions as to how the Storm will function or what touchscreen secrets lie within the Storm's version 4.7 OS, the answers should be covered somewhere between the front and back covers of this whopping document. And if you're looking for more info on the Storm, be sure to check out our Hands-On First Impressions and BlackBerry Storm Super Page!